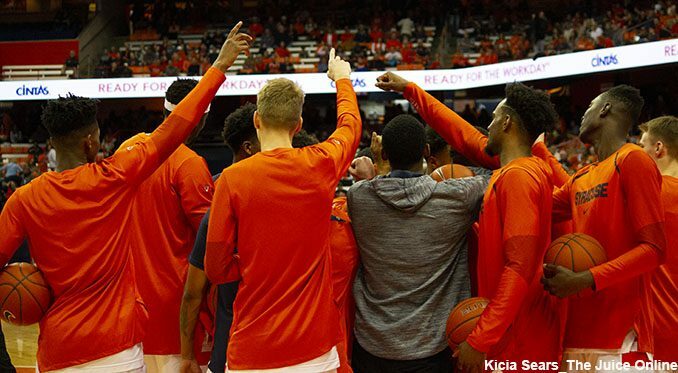 Syracuse basketball players huddle during a timeout. Mandatory Photo Credit: Kicia Sears, The Juice Online. Twice in Boeheim’s 43 seasons he has acceded to Nike’s wishes for an alternate blue jersey (based part on contractual obligations). Ironically, the games occurred 20 years apart – 1988 and 2008 almost to the day. Syracuse wore blue and lost both times, at Kentucky, a Sunday afternoon national CBS-TV game (Feb. 28, 1988), and at Notre Dame also on a Sunday afternoon (Feb. 24, 2008), certainly furthering the coach’s distrust for change. In Feb. 2014, with a 25-0 record and the No. 1 ranking hosting a 6-19 Boston College team, SU wore a hideous orange jersey/blue shorts combo replicating the uniform version worn from 1983-84 through 1993-94, the pants specific to the 1988 blue edition, and shockingly lost 62-59, with Boeheim practically coaching with clenched teeth over his team’s sartorial, or lack thereof, appearance. And finally, this reminder to all of the decision makers at Manley and the Melo Center: There IS precedent to wearing a particular season’s orange road uniform on the Dome home court, and finishing victorious. On Dec. 4, 1990, Syracuse beat North Carolina State 86-79 wearing that season’s orange road uniforms at the Dome in the ACC-Big East Challenge, in which for the two years the event was contested, home teams were the road teams, and vice versa.